to transform your life and reclaim your JOY! Preparatory and follow up support available by phone. Here in paradise, the pallet of possibilities is varied and colorful. Your private session can happen outside in the gentle trade winds along the shore, where life is open, flowing, even effortless. The potency of the beauty and spirit of this land can be an inspiring adjunct to your search for more clarity, aliveness, and empowerment. Private one week intensive on Hawaii Island draw you even more deeply into life-changing immersion where limits become resolvable, old patterns become powerless and vitality and laser-sharp direction become your new life. Join us for the kind of support you’ve always wanted, for the kind of joy you’ve always craved. Counseling Dialogue Sessions can be done while walking at the beach or at local scenic hiking trails. Life Coaching sessions with Joyce Marvel-Benoist can be also scheduled at beachfront picnic gazebos, for those who enjoy the energy of the crashing waves and the ocean breeze! We are happy to come to your home, hotel or condo in the greater Kona area. 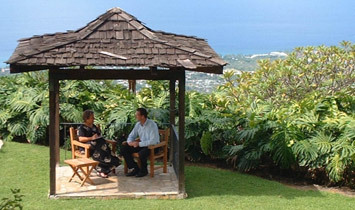 We also coordinate comprehensive healing retreat packages and group programs.